THE ONLY COMPLETE 360 DEGREE VIEW OF BRASOV! ALL ANGLES, ALL FACES, ALL PANORAMAS! See Brasov the best way possible! Hop on your eBike and ride from hill to hill, seeing the entire Historical Medieval Center and getting the absolute best views of the city. We’ll have three hours to cover sights and places take would take you 2 days to cover on foot. We start off in Parcul Livada Postei and slowly ride to the White Tower and the Black Tower overlooking the city. Then come down and follow the old citadel walls all the way to Brașov’s Old Romanian neighborhood of Schei (Romanians were not allowed to live in the city until well into the 18th century) where we find the First Romanian School on the grounds of the First Romanian Church – Church of St. Nicholas. We slowly climb up to the base of the Tampa mountain to find some of the oldest Troițe (small religious structures that the orthodox Romanians build and had to hide before they gained their freedom to practice religion). There are almost 100 of these troițe around the old town, ranging from small crosses to structures of 3sqm. We come down only to slowly start up again to another troită that has the unique advantage of being located next to a classic Romanian confectionery laboratory (always a success with all our groups). Small break and a slice of biscuit salami. Start our descent with more picturesque old cobbled streets. We stop at the city walls for pictures and the Weaver’s Bastion and continue along the Tampa promenade. 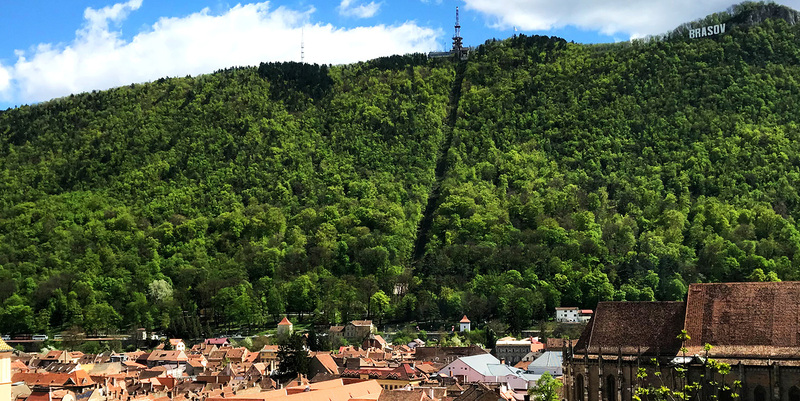 Once back into the city, we cross the Central Park, switch our Ebike motors to Boost and start our climb to Brasov citadel. Another amazing picture-spot, this is already the 4th hill we’ve climbed in the last 2.5 hours.Which concludes the tour. From here it’s a short way down back to Livada Postei where we began.